High on a mountaintop in the Carpathian Mountains of Western Ukraine lies the small village of Bukovets. The rolling hills are green and echo the sound of cowbells in the distance. The old wooden church of the Hutsul people marks the high pass where the villagers gather for spiritual occasions. In this fairytale village you can still hear the Trembita being played at funerals. This beautiful village that honours the past is the home of Mikhailo Tafichuk. Mikhailo Tafichuk has been playing music his entire life and now is one of the few remaining master craftsmen of many of the unique Hutsul instruments like the Duda (Ukrainian bagpipe), Lira (Hurdy Gurdy) and Trembita (Mountain horn). Tafichuk spent his life working as a blacksmith in the Soviet collective farm. Now he spends his time making his instruments and fashioning the tools he uses to make these instruments. Mikhailo is fearful that these traditions aren’t being passed on to future generations. If there is no one interested in learning the craft, it’s likely that these instruments will be lost for future generations. His home is painted the blue and yellow of the Ukrainian flag. It’s hidden in a secret place far from the main road but once you’ve been there, you’ll never forget the magical experience. His wife, who sells traditional Hutsul embroidery, greets us and sets the table while Tafichuk himself pours the home-brew and plays on the beautiful instruments he’s created. 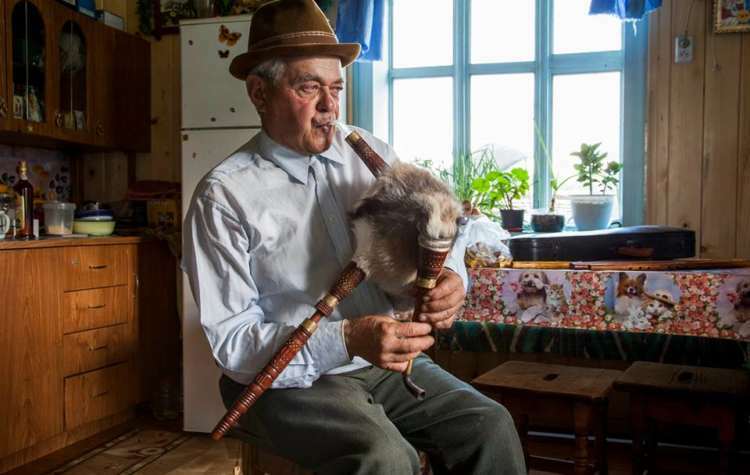 He offers tourists the chance to own sopilka (flute) or a Drymba (mouth harp) or maybe even a special Hutsul Skrypka (violin). You never know when it will be the last chance to own one of his works of art. Mikhailo Tafichuk may be one of the last Hutsul musical magicians. Top 5 Group Tour Myths – Busted!